I recently went to an electronics retailer in search of “noise canceling headphones” for my iPod. You know, the kind you see people wearing on the airplane – they “cancel” out any ambient noise (my wife calls them “Sarah canceling headphones”). When you put them on you feel like someone shut the door on a noisy party next door. It makes you focus on the topic at hand. In my case I use the iPod mostly for audiobooks and it makes a big difference. 1. Dow Theory provides us with a binary answer. That means it’s either 1 or 0. There is no room for interpretation. The “noise” as it were, is cancelled out. A “BEAR” signal is in force until such time as a “BULL” signal has been given. Think of the light switch in your kitchen. Once you turn the lights OFF, you can’t turn them OFF again until you turn them ON. There is a lot of bad information on the web about Dow Theory, including some high priced subscription letters that have made many mistakes in the last two weeks interpreting this exact situation. 2. Charles Dow, writing over 108 years ago, used only daily closing prices. An intra-day high is just more noise that is canceled out. The reason is that Dow felt that a closing price trumped all other intra-day prices because it represented a price that traders and investors were happy to carry home overnight. This showed more of a commitment. This is important as you will see below. The point I am trying to impress upon you is that the Dow Transportation stocks may “know something” that the Dow Industrials don’t. The failure of the Transports (lower high in June than in May in lower box above) signals a divergence in the indicies. William Hamilton, Dow’s understudy, warned of such divergences in the indicies as potential danger spots. GOLD STALLS… The downside target for Gold remains around $830 based on the sell signal shown in Chart 2. Declining jewerly demand and lack of catastrophe buying has halted the demand for Gold below it’s all-time high of $1030. OIL FALLS… On news that the OPEC production cut that was expected March 15th may not materialize. Is this a new down leg or just a pause after the recent breakout to the upside? Chart 3 shows the bullish target at $60. A decline in the US dollar may help oil reach that target. NDT Conclusion: Continue to focus on capital preservation. This is still a BEAR market until proven otherwise. Bear market rallies can be tantalizing opportunities, however, only the most nimble of traders can make money on the long side when the primary trend is down. DOW THEORY GIVES US A WARNING SIGN… This is mostly a reactionary business. I tend to let the markets tell us what to do. After all, it represents the collective wisdom of the thousands of market experts, participants, hedgers, speculators and novices. Everyone’s opinion is distilled into price. For an un-emotional barometer of price activity — I tend to lean on Dow Theory. Over 100 years ago, Charles Dow suggested that the Industrials and Transports must move in unison to give valid signals of the primary trend. If one index makes a new high and the other does not, we have what’s called primary a non-confirmation. Imagine that you are trying to teach a child how to determine if the tide is coming in or going out. One way to illustrate this would be to put a stick in the sand where the waves currently stop, and then wait for the waves to exceed that stick and move it to the new high point. Dow suggested that in order to be sure that the tide is rising, you would need a friend on the other side of the bay to confirm your observations. Right now we have the Transports making a new high (see chart 1 below), while the Industrials are a big 1,526 points below their record highs of 14,164.53. Where I live, this is analogous to the waves hitting a new high on Jericho Beach on the West Side of Vancouver, while the waves at Ambleside Beach in West Vancouver are no where near their highest point. ENERGY STOCKS REACHING THE END OF THEIR SEASONALLY STRONG PERIOD… In each of the last 10 years, had you bought energy stocks at the end of November and held until the end of May, you would have averaged a 19% return. 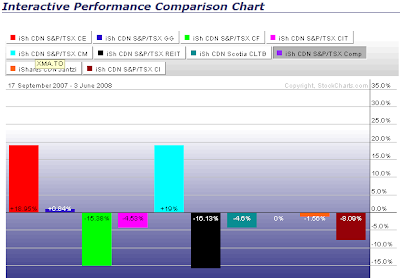 Conversely, the return for the TSX Index from end of April until the end of September over the same period is -0.59%. Given that the majority of the strength in the TSX has come from Energy and Materials the past few months (see red and cyan bars in Chart 2 below), we might be wise to put in some protective stops to protect our profits on Energy stocks. CONCLUSION: I am cautious in the next three to six weeks. I am modestly bullish of commodities via ETFs like DBC and DBE, and bullish of commodity based currencies like Australian Dollars and Swiss Francs via FXA and FXF. Canadian stocks should benefit from Yen carry trade. Avoid long dated bonds. THOUGHTS… I just returned from an investment conference in Scottsdale where a parade of analysts took the stage to tell a room full of advisors where to put their clients’ money. A friend of mine nudged me with “ooh, so-and-so is up next – he beat the market last year.” Rather than be impressed I was reminded of Nicholas Taleb’s story in The Black Swan. If 5,000 people flip a coin at the beginning of the year, after 5 years you will have 313 that have flipped 5 heads in a row. If you put these people in suits and call them hedge fund managers, they will each earn seven figures. Of course, their odds of flipping a sixth HEAD is still 50-50.